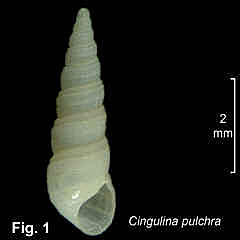 Description: Shell medium size, of average width for genus, spire weakly convex in outline, up to about 9 whorls. Protoconch (Type B) coiled, about 1¾ whorls, set on teleoconch with axis inclined at about 110° to teleoconch axis. Teleoconch whorls rounded, sculptured with 3 low, wide spiral cords, the uppermost narrower, separated by narrow, deep grooves sometimes with fine axial threads within; one or more further fine grooves on base; suture distinct. Aperture teardrop-shaped, length greater than width; no plaits on columella. Shell translucent becoming opaque white with age. Size: Up to 6 mm in length. Distribution: Endemic to Australia: Sarina, Qld, southwards and around southern Australia to Geraldton, south-western WA but not in Tasmania. Habitat: In NSW, known from beach washup and down to 20 m. Common. Fig. 1: Ocean Beach, Kurnell, NSW (C.342128).